Image courtesy of Moviestar1999@Deviantart (linked) – fair warning; Deviantart is NOT a site for kids! In case you haven’t seen the critical reviews… or looked at rotten tomatoes, let me just sum up and say – critics did not enjoy “HOME” and they’re giving Dreamworks a really hard time for even making this FANTASTIC movie! 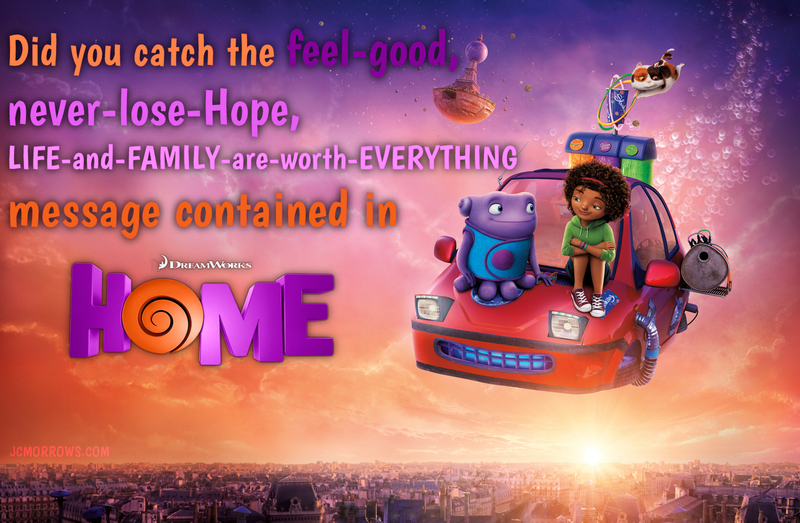 The movie market right now is filled with all of these feel-bad, world-ending, life-after-war-is-horrible type movies and the feel-good, never-lose-Hope, LIFE-and-FAMILY-are-worth-EVERYTHING message contained in “Home” might just be a bit over their heads at the moment. Family IS the heart of the entire movie! HOPE is the thing Tip holds onto no matter what – and she translates that to Oh as well! Tip doesn’t GIVE UP easily! It doesn’t hurt either that the main character is NOT a teeny twig. I LOVE the choices for Tip and Lucy. And such GREAT songs too! Don’t get me wrong… it’s not all rainbows and happy, fluffy feelings. The movie has some super negative things going on. I won’t spoil them for you, but if you’ve seen the previews you pretty much know it’s about aliens taking over Earth – so you get the idea. WE NEED MORE movies like THIS! Perhaps if we had more wonderful, feel-good movies, there would be less unhappiness in our world! In the meantime, I’m off to Wal-Mart to buy the movie for my kiddos! We rented it because that’s what we usually do when we’ve not seen a movie but this is one we HAVE TO BUY! Critics are among the worse form of life, these people have made a career out of perpetuating their opinions as fact, I’m sure nothing can go wrong. The problem is critics grade movies by their technical approach and consider the “feel good aspect” as cliche. Then you have the ones who are part of the social engineering movement to drive people into hopelessness and despair, I am not going to into the reasons why, but they are dire and downright morally wrong. Critics are given so my credibility and credence yet when you stop and think about it, they are losers who couldn’t hack it in Hollywood and made a career out of telling winners what a good movie/tvshow is. It’s like listening to a guy who can’t dunk telling Lebron James on proper dunking technique. It’s moronic. My suggestion is if you really love a movie or show and want to see more, let the production company know, let the studio who employs the production company know, in the light of the internet, it’s very easy for a person or small group to have a large voice. My suggestion is, use that voice and let them know you want more, they will listen.